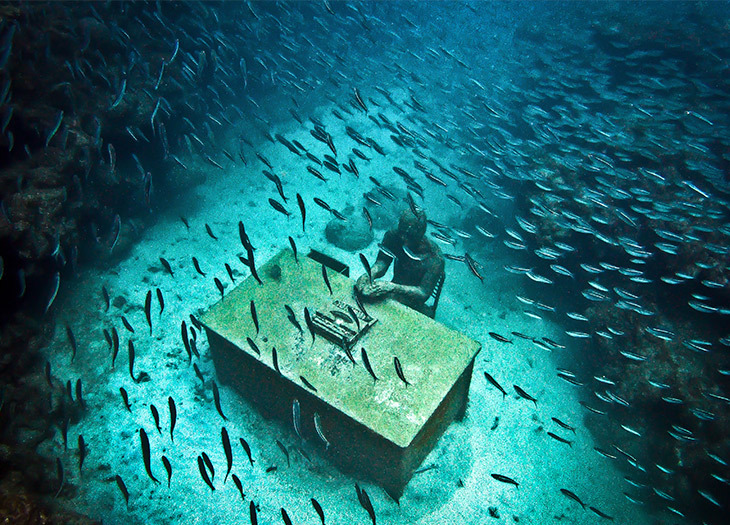 'The Correspondent' at Grenada's Underwater Sculpture Park. Explore the world’s first underwater sculpture park in Moliniere Bay. Spice Island Beach Resort, Grenada. One of Grenada’s most popular attractions is not actually on the Caribbean island, but off the coast and 25 feet below the surface. 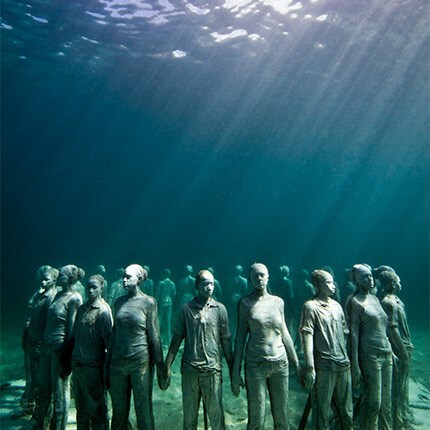 In 2006, former dive instructor Jason deCaires Taylor wanted his work to provide a benefit beyond its artistic existence, so he created dozens of concrete and rebar sculptures to double as artificial reefs. Since their installation, the pieces (including Vicissitudes, shown above) have changed color and texture, thanks to the variety of marine life they’ve attracted. Other artists continue to contribute to the underwater gallery, which is populated by parrot fish, tubular sponges, and fireworms, offering a different type of museum experience for adventurous art admirers. Spice Island Beach Resort works with preferred vendors to arrange snorkel and dive tours to the sculpture park. Tour operators pick guests up from the all-inclusive, 64-room resort on Grand Anse Beach for a cruise to Moliniere Bay.